For today's Wednesday Vignette, the weekly feature hosted by Anna at Flutter & Hum, I took a few photos of the combination of plants I see through the window when sitting on the living room couch. 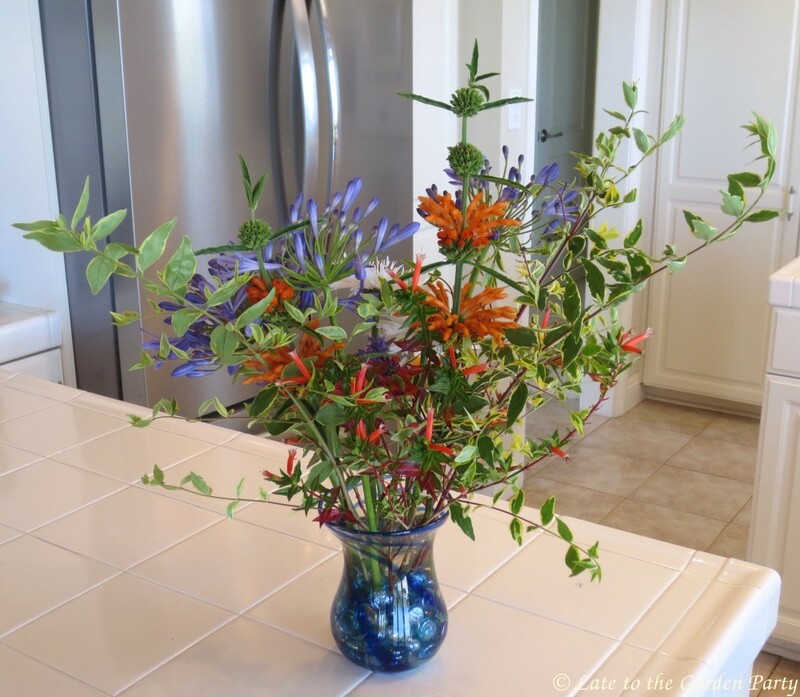 The view has been energized by a strong showing on the part of Leonotis leonurus, also known as lion's tail, but the assemblage also includes Achillea 'Moonshine', Callistemon 'Cane's Hybrid', Coleonema pulchellum 'Sunset Gold', Euphorbia 'Ascot Rainbow', Gaillardia 'Arizona Sunset' and Leucadendron 'Jester'. I took multiple photos as my husband gave me a new camera for my birthday and I used this as an opportunity to evaluate the differences between my old camera and the new one, which came with multiple lenses. This photo was taken with my old point-and-click Canon PowerShot. It provided the most vibrant colors. This photo was taken with my new Nikon D3400 using its standard lens. It provides a wider view but the colors are more muted. It's going to take me a while to determine which camera is best for which uses. 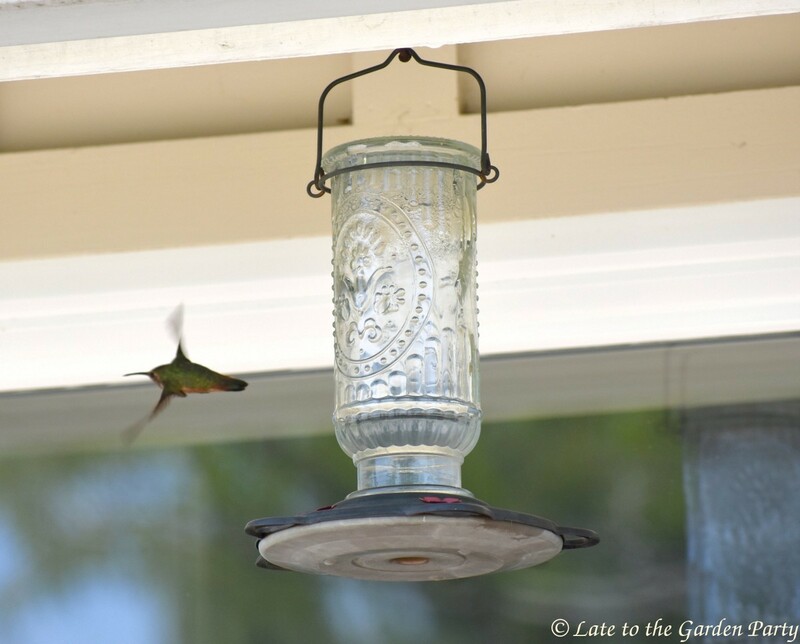 I'd hoped the new camera would improve my ability of capturing photos of the hummingbirds. No such luck. I lurked around the feeder at a comfortable distance for a long time but the hummers are currently more focused on battling one another than feeding. This one took chase just as I was focusing my shot. 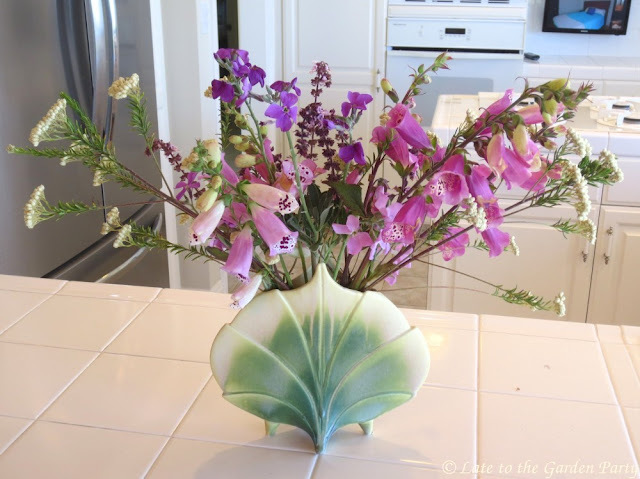 Visit Anna for more Wednesday Vignettes. 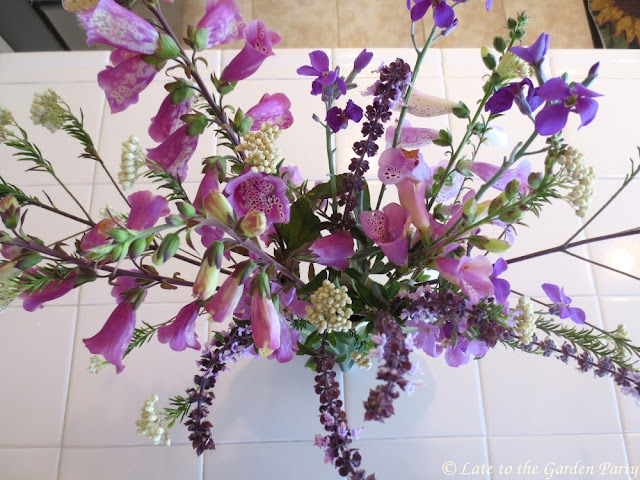 Thankfully, the weather did turn cooler last week so the foxgloves got a stay of execution; however, the winds have been persistent so, when it came time to select flowers for "In a Vase on Monday," the meme hosted by Cathy of Rambling in the Garden, I was still focused on using the flowers I thought might soon be gone, including the foxgloves and Renga Lilies. This week I chose to combine the two and used Centaurea 'Silver Feather' to bring out the pinkish-lavender colors in both. I allowed the largest artichoke on the plant growing along the back slope to flower this year, as shown on the left. 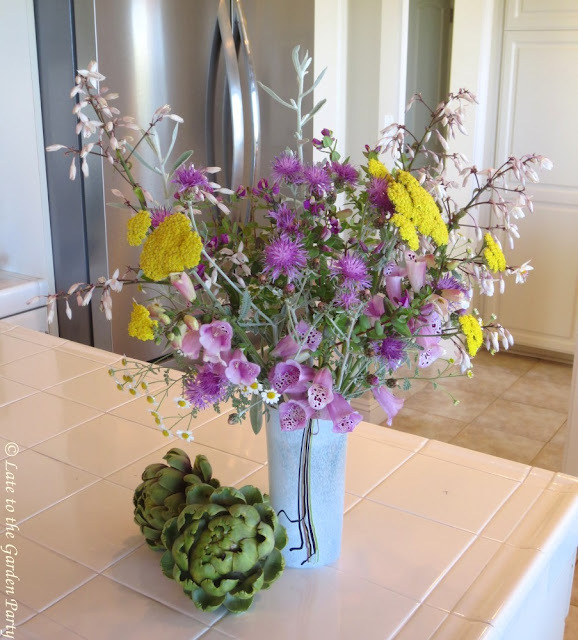 The artichoke-like buds of the Centaurea can be seen on the right. As today is Memorial Day in the US, a red, white and blue combination was also called for but I didn't have any suitable red flowers on hand so I went with orange, white and blue. Front view: the parade of Agapanthus has begun! Best wishes to all enjoying a long holiday weekend in the US, UK and whichever other countries are observing a holiday at the end of May. Visit Cathy at Rambling in the Garden to find more vases cobbled together from floral and foliage materials close at hand. I'm joining Loree of danger garden in recognizing my favorite plants this month. 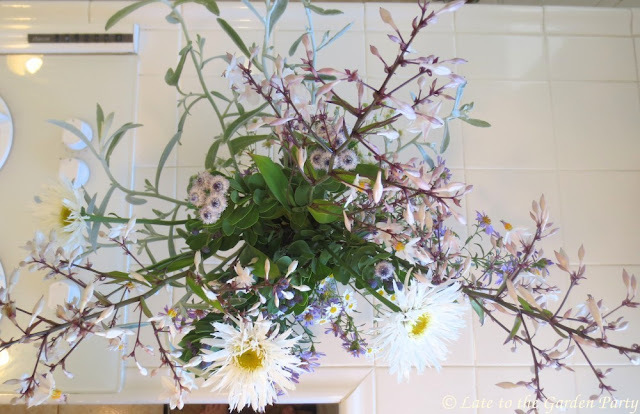 I can't see the foliage for the flowers right now so perhaps it's not surprising that all my current favorites are in flower, even if at least some of them were originally planted specifically for their foliage. Achillea 'Moonshine' began blooming at the start of the month and it's in full flower now. It has a long bloom period. Last year, it bloomed from the latter part of April until mid-September. It's sunny presence dominates my back garden at the moment. The next plant, Arthropodium cirratum, commonly known as Renga Lily, is my go-to favorite for dry shade. 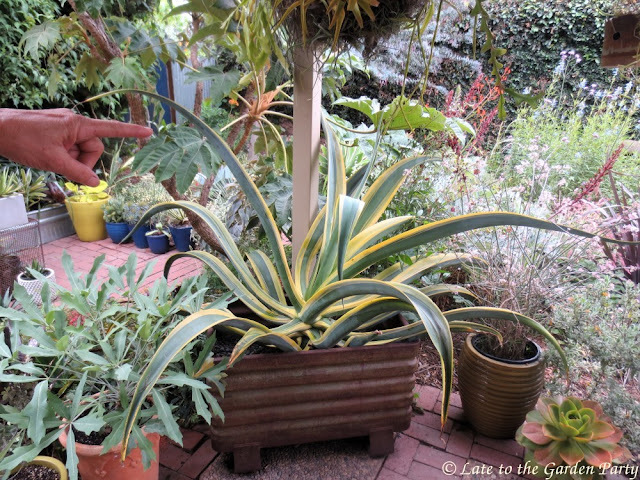 I purchased my first plant in January 2011 by mail order and added more later the same year. 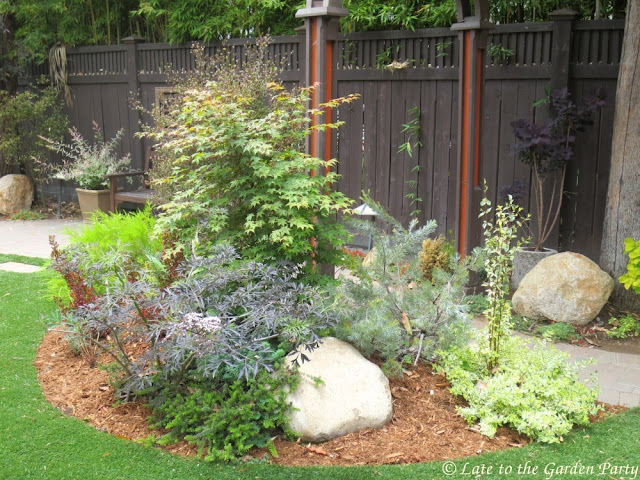 In January 2012, I even added 3 plants to my neglected back slope. 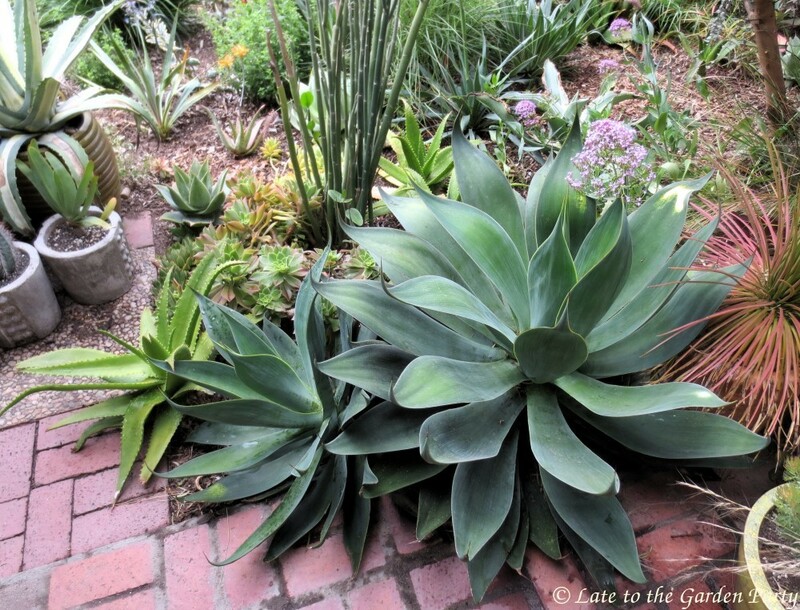 They survived there and even bloomed but, when the removal of the giant Yucca elephantipes made the area much sunnier, I pulled the plants, divided them, and replanted them in shadier locations. Within 2 years, they form large clumps and dividing them is relatively easy. The last time I did so, I had not only enough plants to fill another area newly cleared of lawn but also enough to give to a friend and a next door neighbor. And, with still more plants left over, I placed the bulb divisions in buckets along the street (with a plant description) to be taken by anyone who walked by. They need periodic dividing as they otherwise get huge and baiting for snails is essential. 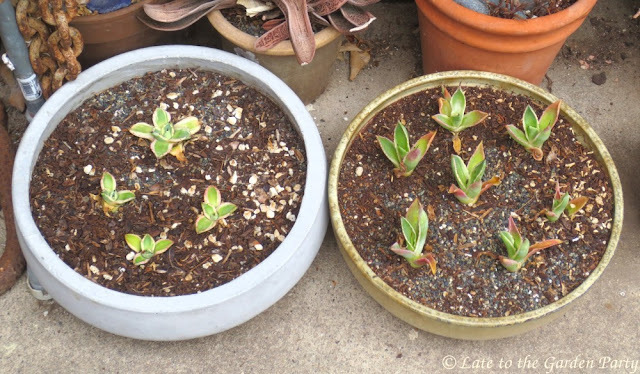 I planted 3 Centaurea 'Silver Feather' in March 2015 for the foliage. I considered that the pinkish purple flowers mentioned on the tag would be a bonus. My plants didn't bloom in 2015 or 2016 and I'd pretty much given up on their doing so until the first flowers appeared earlier this month. According to the tag, the plant was supposed to grow about 16 inches tall and 12 inches wide and I planted based on those dimensions; however, even after hacking the plants back this winter, they're closer to 30 inches tall and wide. In colder climates, I understand that they'll die back over winter but here the plants are ever-silver. 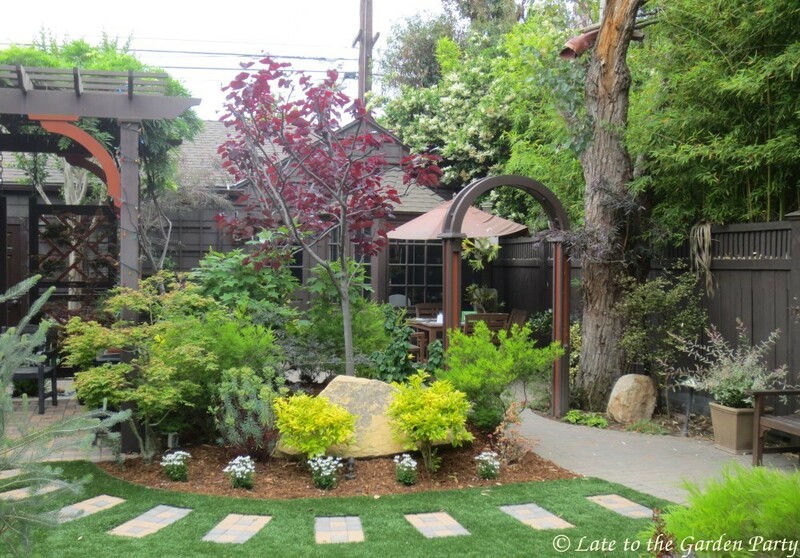 The plants weren't intended to block the flagstone path. I may try moving them this fall. Dorycnium hirsutum (aka Hairy Canary Clover), another silver-gray plant I introduced for the foliage, is also in bloom at the moment. It self-seeds freely here and, although the seedlings can be touchy about being transplanted, I've managed to spread it through several areas of the garden. It stays low and makes a good weed-suppressing ground cover. The foliage is soft and fuzzy to the touch. 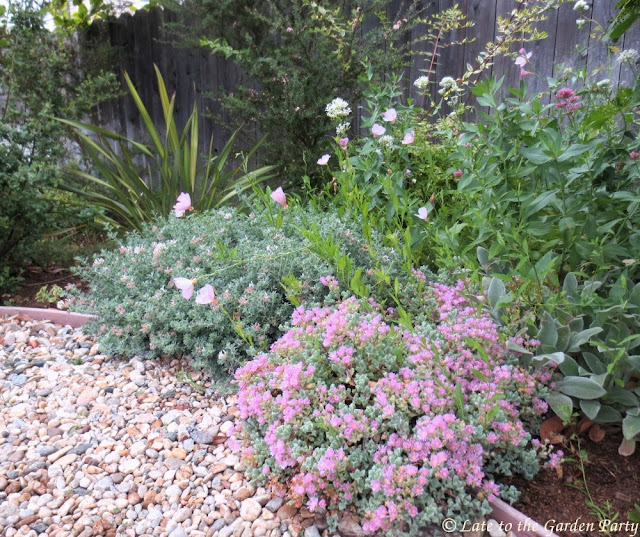 The bees love the clover-like pink and white flowers. 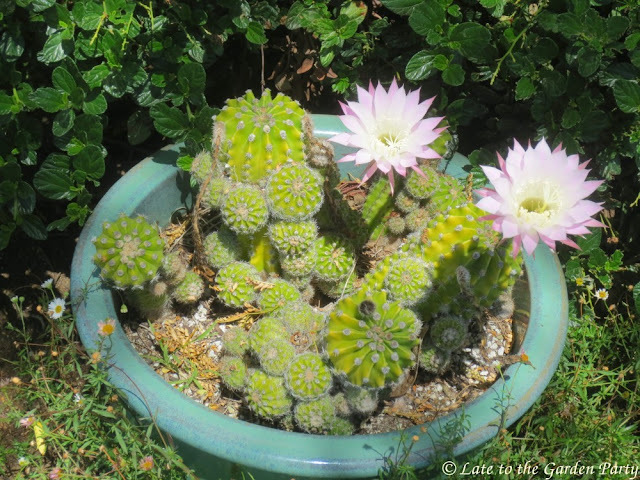 Another pink-flowered plant that surprised me with recent blooms is Echinopsis oxygona. A gift from a friend, I thought I'd missed out on the flowers this year but 2 more flowers appeared this week. I'm thinking of giving the plant a chance to live outside its pot but I'm dreading the transplant process. I included Euphorbia 'Dean's Hybrid' in this month's favorites post principally because it just looked so good backlit on the back slope paired with Agave attenuata. I've cut back most of the flowering plants on the slope so there's not a lot of color there at the moment but 'Dean's Hybrid' adds a nice glow to the space. 'Dean's Hybrid' has grown on the dry back slope for 5 years now. It dies out here and there but gently spreads itself around, always forming nice big clumps of chartreuse color. Believe it or not, I also bought Globularia x indubia for its foliage. I liked the thick, almost succulent leaves. I'd never heard of the plant when I picked it up at a local botanic garden sale in 2012. Its blue and white flowers were a surprise. It's been slow to beef up but, like so many plants in my garden, I think this past winter's heavier-than-usual rains gave it a major boost. My next favorite, Jacaranda 'Bonsai Blue', is a relatively new acquisition. I picked it up as a Christmas present to myself late last year, after giving up the hope that its price would come down. 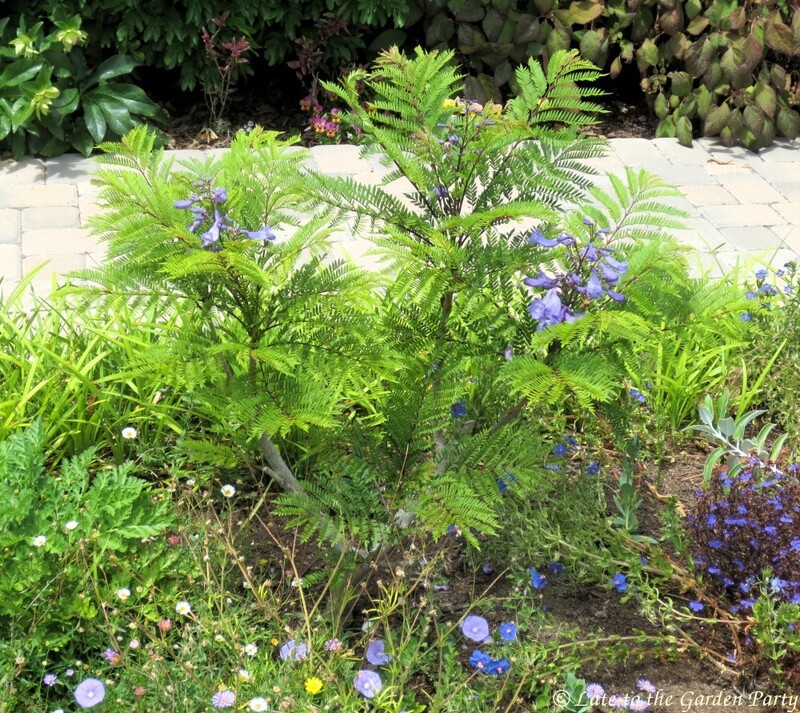 Living in Southern California, you can't help but fall in love with Jacarandas. They're common here and, despite being one of the messiest trees around, are frequently used as street trees. Regardless of their messy ways, they're gorgeous when in bloom; however, the common form can grow 40 feet tall, which creates an issue in my community if it's planted anywhere that might interfere with a neighbor's view. 'Bonsai Blue' is a dwarf. The tag said it grows just 6 feet tall but other sources claim it can get 10 feet tall. Even so, that's under the limit specified by my community's "view conservation" ordinance. Some people consider Shasta daisies, Leucanthemum x superbum, common but I love them. I have a ruffled form, sold without a cultivar name. 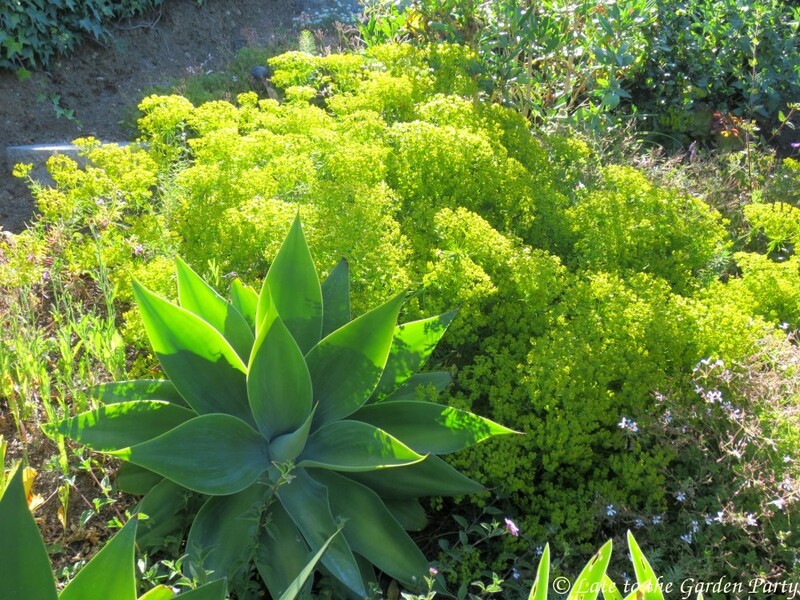 They flower on roughly the same schedule as Achillea 'Moonshine', although they don't have quite as long a bloom period. Their petals are such a bright white I found them hard to photograph even under cloudy skies. The small white flowers of Tanacetum niveum were easier to photograph. 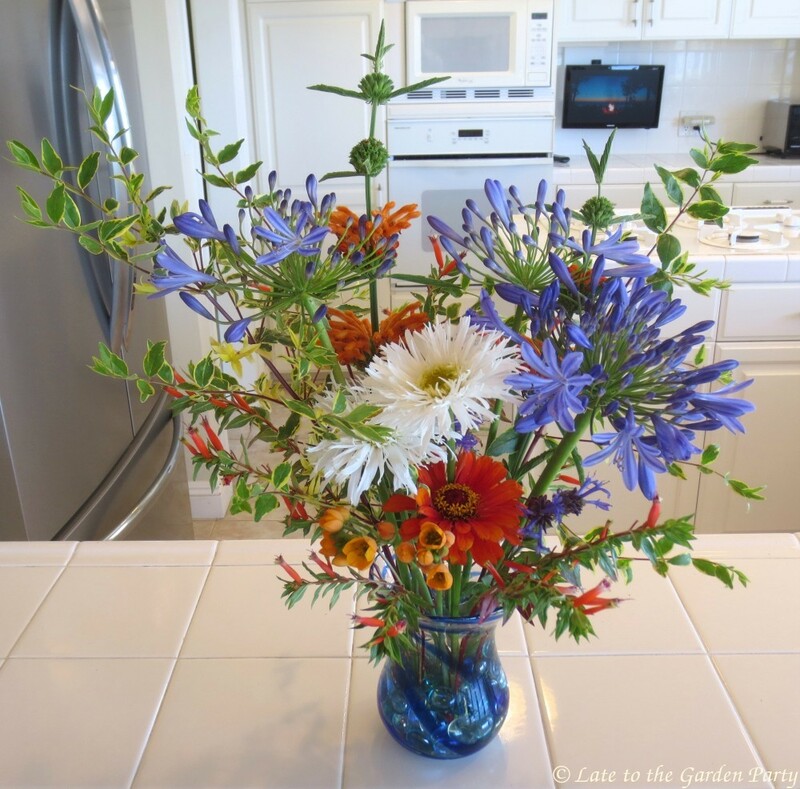 Like the larger Shasta daisies, they add a sparkle and freshness to the garden. 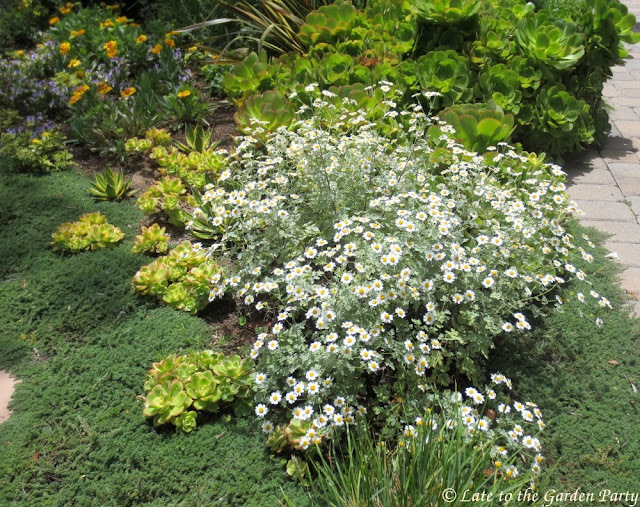 The flowers look like those on the common feverfew but the foliage is a soft gray color. 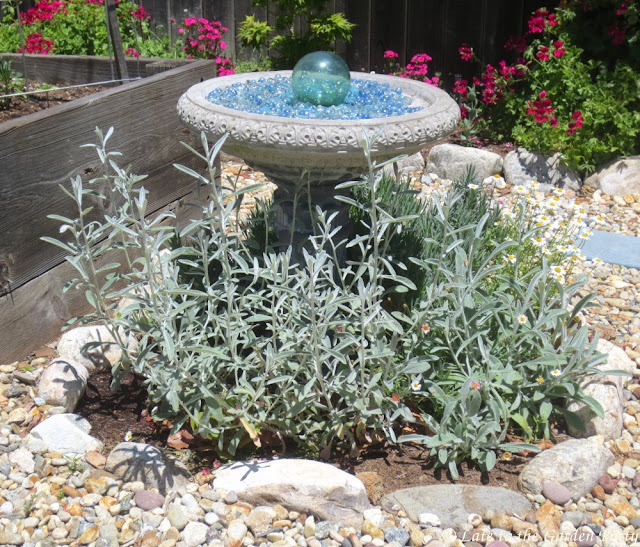 The plant is moderately drought tolerant. I'll close with a mash-up of 3 evergreen vines that flower in unison at this time of year: Pandorea jasminoides, Trachelospermum jasminoides, and Pelargonium peltatum. Although these are relatively common plants, at least here, their combination is somewhat unexpected. 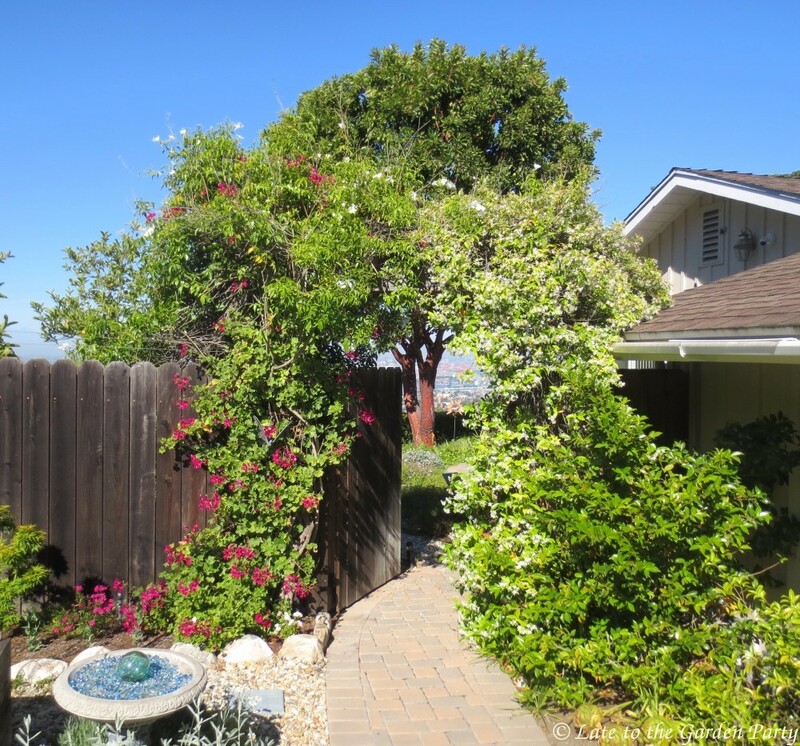 The white bower vine and star jasmine were in place when we moved in. I added the dark pinkish-red Pelargonium, which I'd brought with me from my former garden. I hadn't intended to have it climb the arbor to join the other 2 plants but it had aspirations and took off on its own 2 years ago. The only problem with this mash-up is the difficulty in keeping it trimmed. I'm going to have to get a ladder out to cut it back this year. 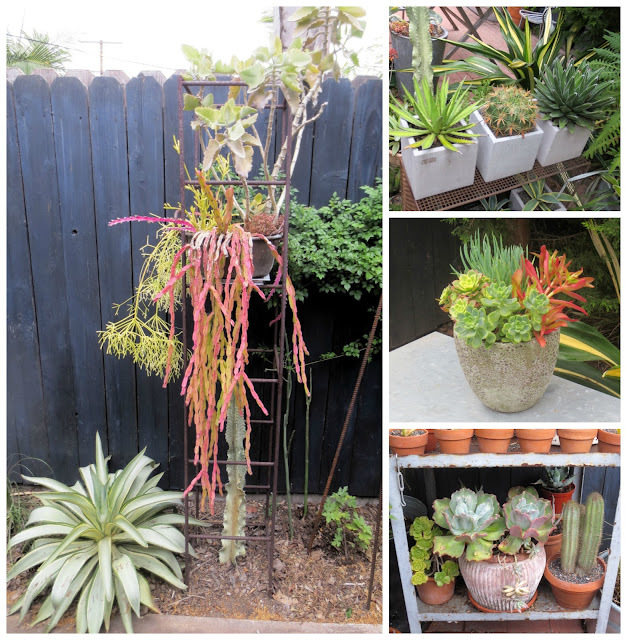 Visit Loree at danger garden for a look at what she and other gardeners are favoring this month. 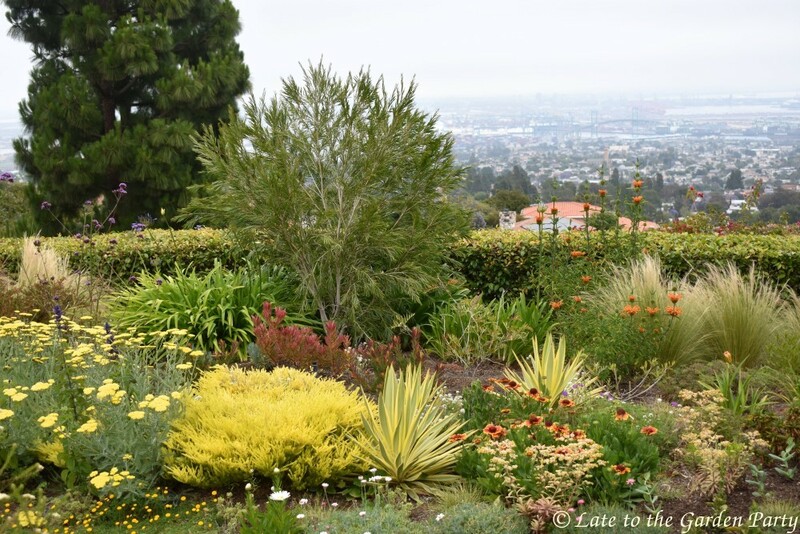 In early May I joined two other SoCal bloggers on a tour of the three gardens included in the Long Beach leg of the Mary Lou Heard Garden Tour. My previous posts can be found here and here. 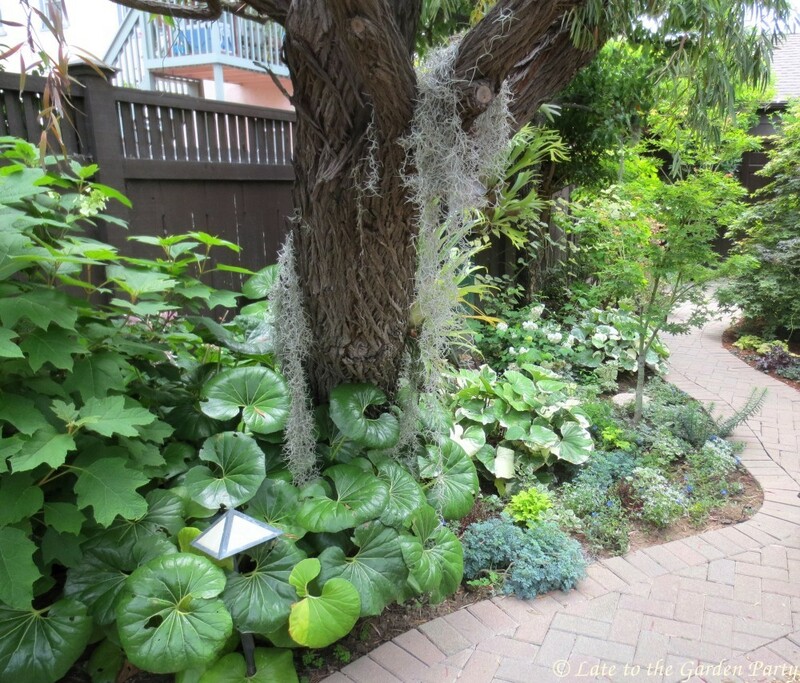 The third garden we toured was small, as gardens in beach cities often are, and I took relatively few photos. 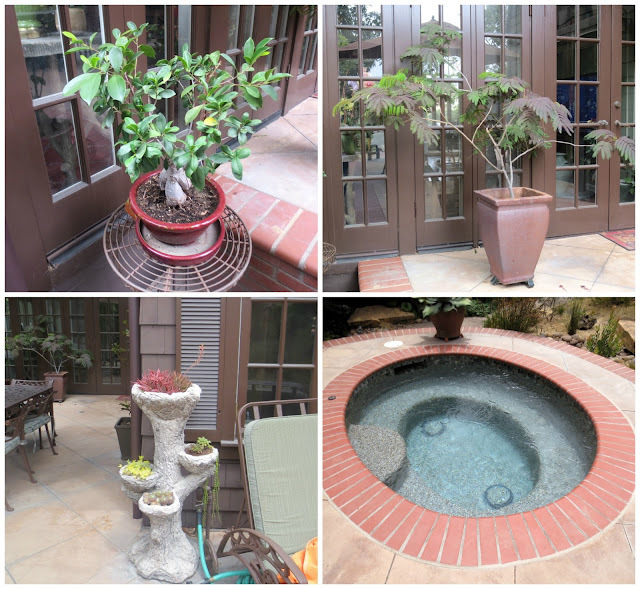 It was a sweet space but didn't have the intriguing plant choices of the first two gardens we explored on the tour. 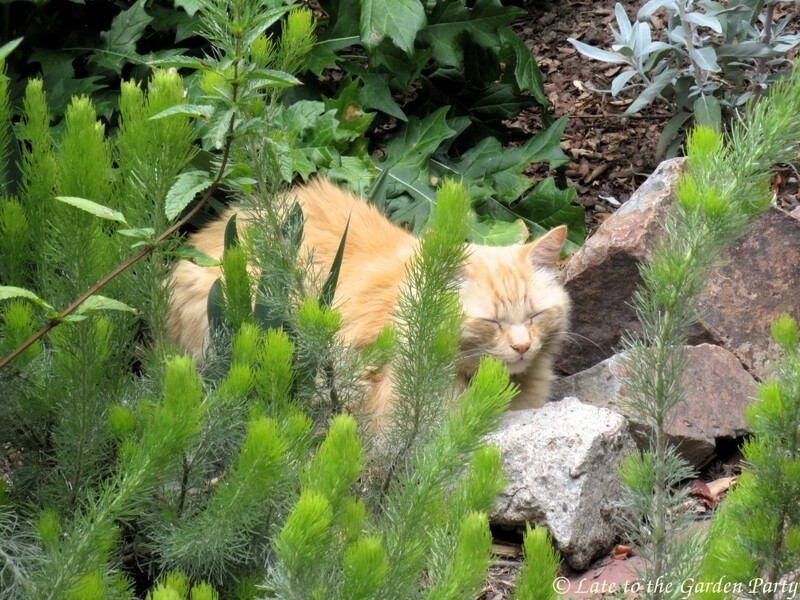 However, we did peruse another garden that was chock full of wonderful plants. That garden wasn't on the tour but it should have been. It's the garden created by Denise of A Growing Obsession, the blogger who arranged our excursion. 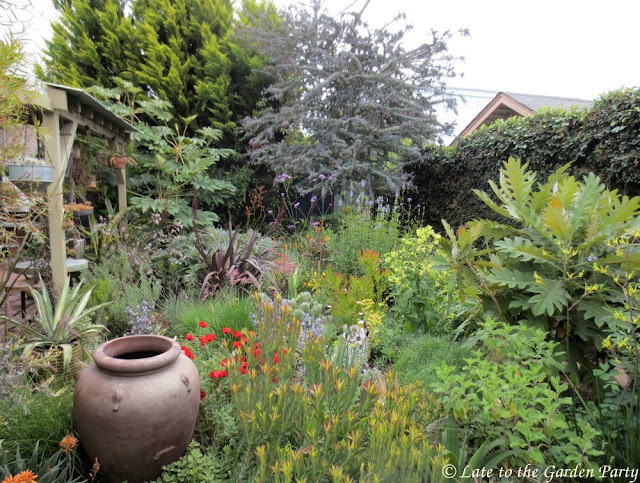 I've visited Denise's garden once before but that visit occurred in late summer on a very sunny afternoon. This time I had the opportunity to stroll the space under a more camera-friendly cloudy sky. As you can already tell, Denise's garden is densely planted. Everywhere you turn, there are interesting vignettes. 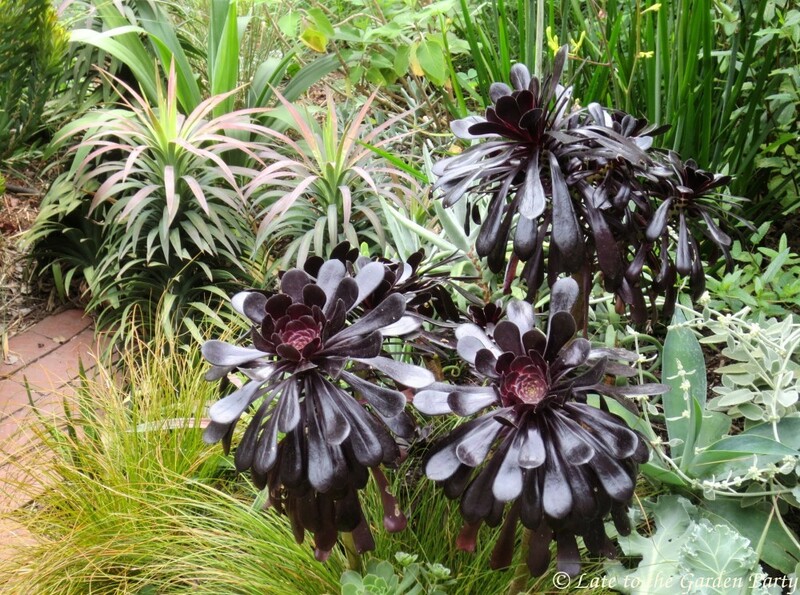 Could there be a better pairing than this silvery blue Agave and the deep burgundy Aeonium? How about this one featuring Yucca desmetiana 'Blue Boy' and an almost-black Aeonium? 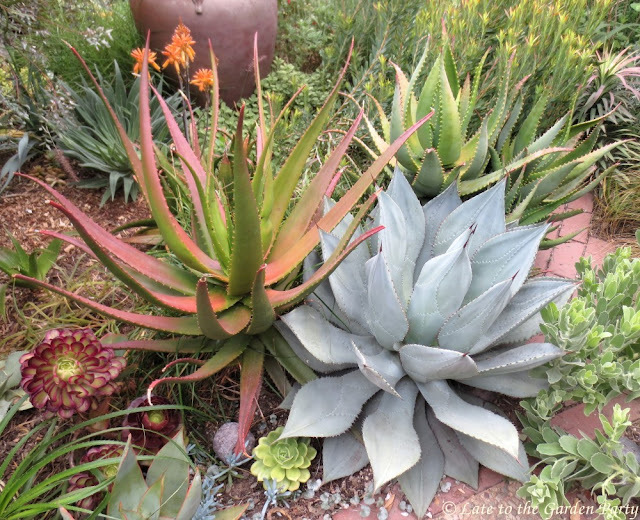 Or this one featuring Agave 'Blue Flame' and an Aloe I can't identify with Centranthus ruber making an unexpected cameo appearance? This photo captures one of my favorite Agaves, A. pygmae 'Dragon Toes', with another Aloe I can't identify, all the more beautiful for blushing under stress. On the lower left, is Aeonium 'Mardi Gras', a plant I've long coveted but have yet to find. There were other plants in containers clustered in groups. And there were plants that made me green with envy. Some of Denise's plants are huge, sending chills down my spine when I realize that I probably haven't allocated quite enough space to the specimens in my own garden. Denise also has plants-in-waiting for the day some of her mature Agaves bloom and die. 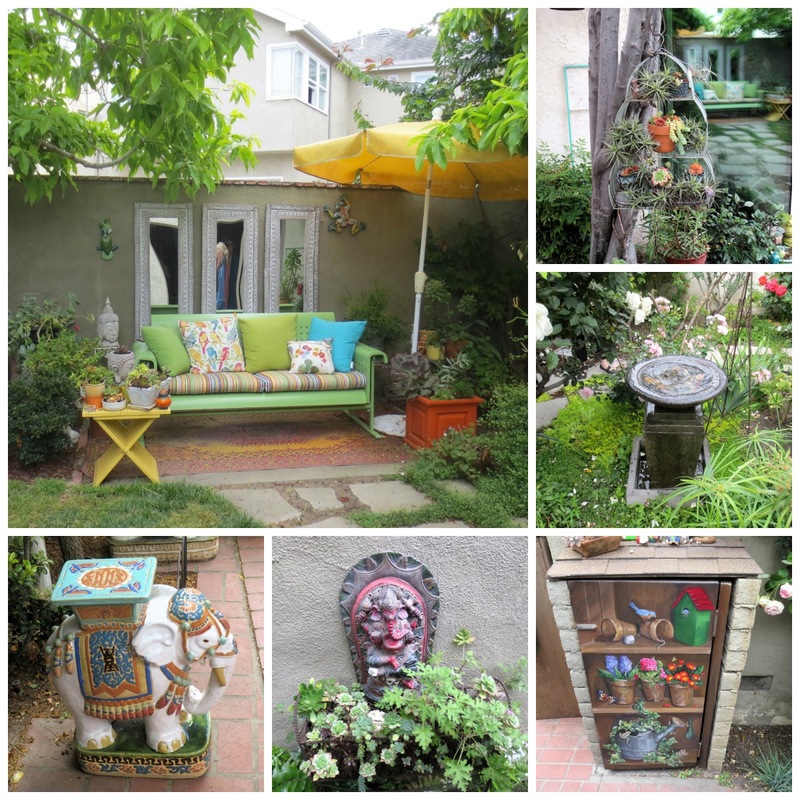 Thanks for opening your garden for our visit, Denise! 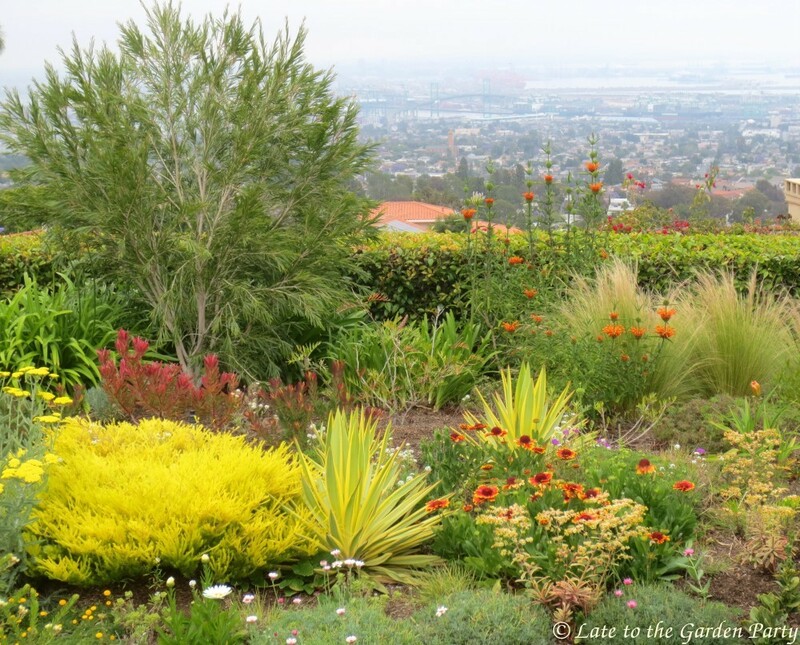 Readers can find more photos of Denise's garden on Hoover Boo's blog, Piece of Eden, here. 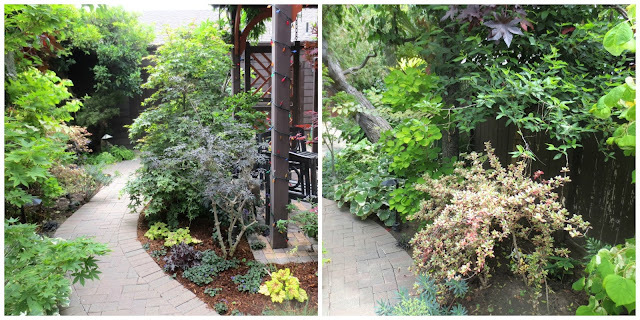 And, if you want to see the changes Denise has made to her garden since our visit, you can find those in her recent Bloom Day post here. 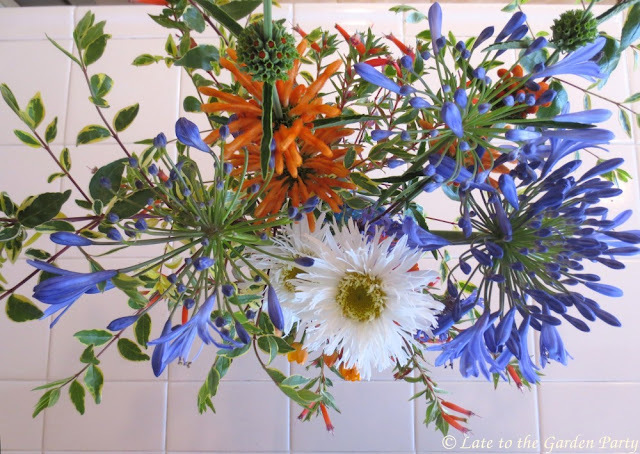 In a Vase on Monday: The heat is on! Our temperatures soared above 90F (32+C) this past weekend and the Santa Ana winds returned, stressing both the garden and the gardener. 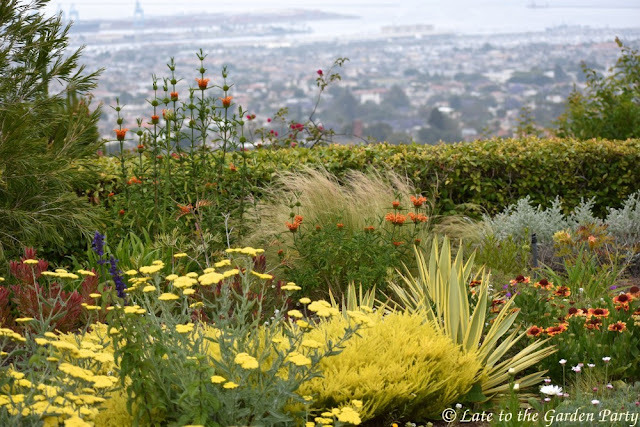 Unlike our earlier bout with heat a few weeks ago, it didn't cool down significantly at night and the marine layer characteristic of this time of year, known locally as "May Gray," was a no-show. 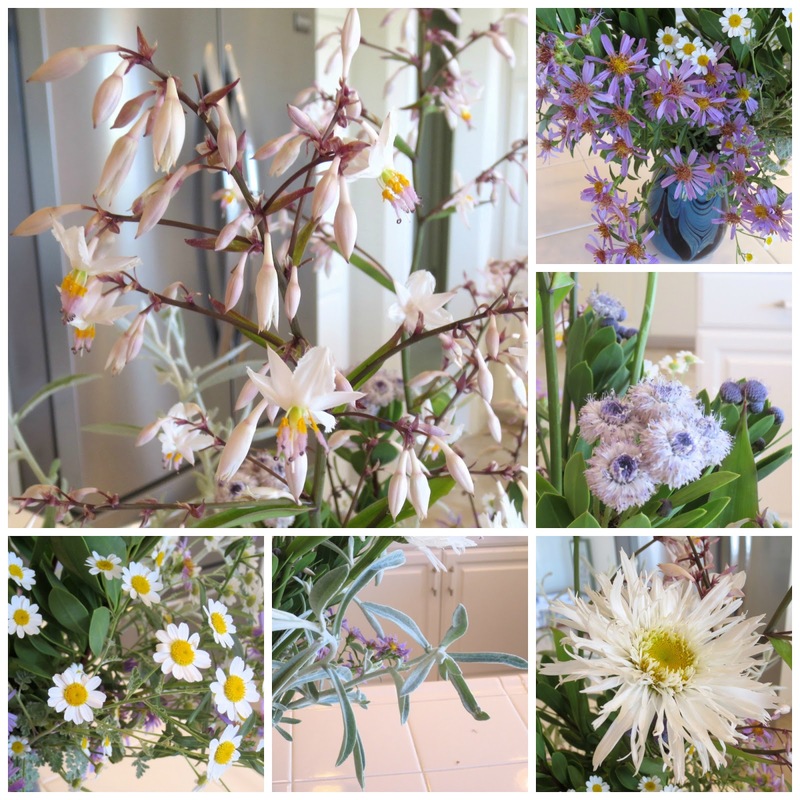 So, instead of an open-ended journey of discovery, this week's Sunday foray into the garden in search of plant material for "In a Vase on Monday" was more of a search and rescue operation. My biggest concern was the foxgloves (Digitalis purpurea) in my cutting garden. I've already pulled out my sweet peas and Iceland poppies to make room for sunflowers, zinnias, and dahlias. 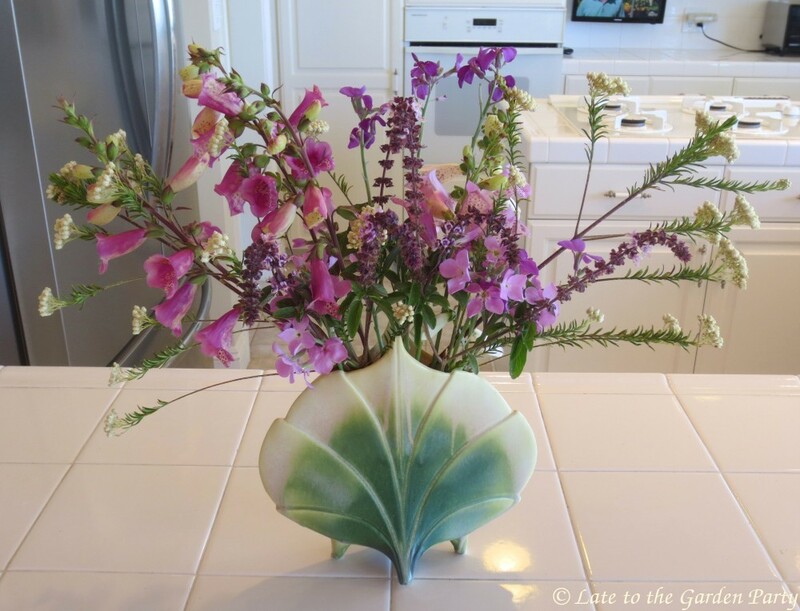 The sweet peas and poppies began blooming in February so they had a decent run before the earlier heat spell withered them in place. 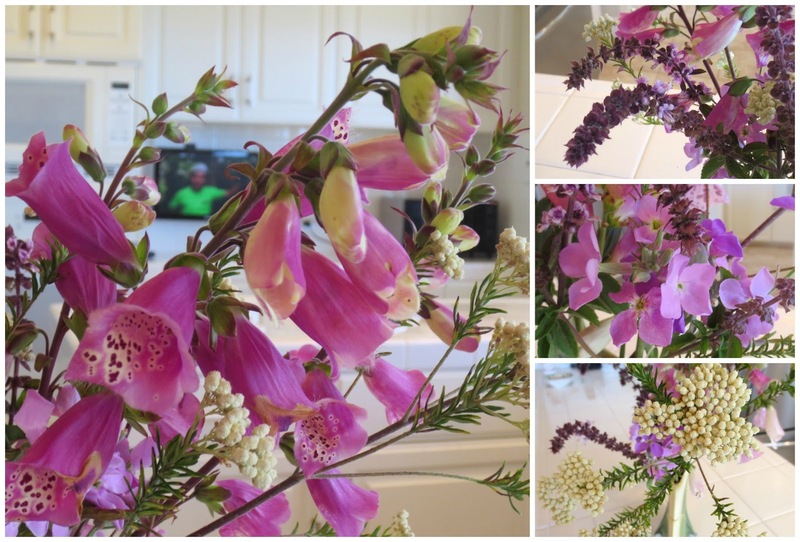 On the other hand, the foxgloves didn't begin blooming until the latter part of April so I've been reluctant to pull them out, even if they're no longer looking their best. I chose the stems least marred by the heat for my vase. 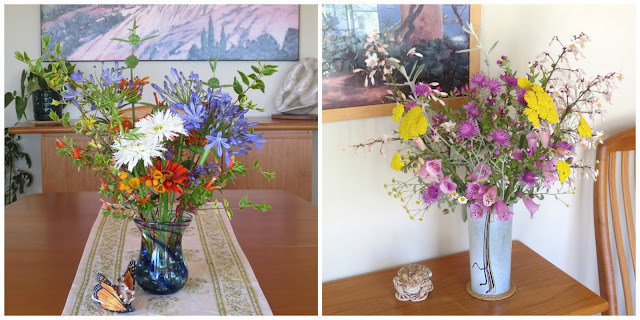 I had more fun with the second vase, which utilized summer blooms. The Renga Lilies (Arthropodium cirratum) are all in full bloom now and I had longer stems to play with this week. My Shasta daisies are also making their first appearance this year, joined by an unexpected flush of flowers I hadn't expected to see until much later. 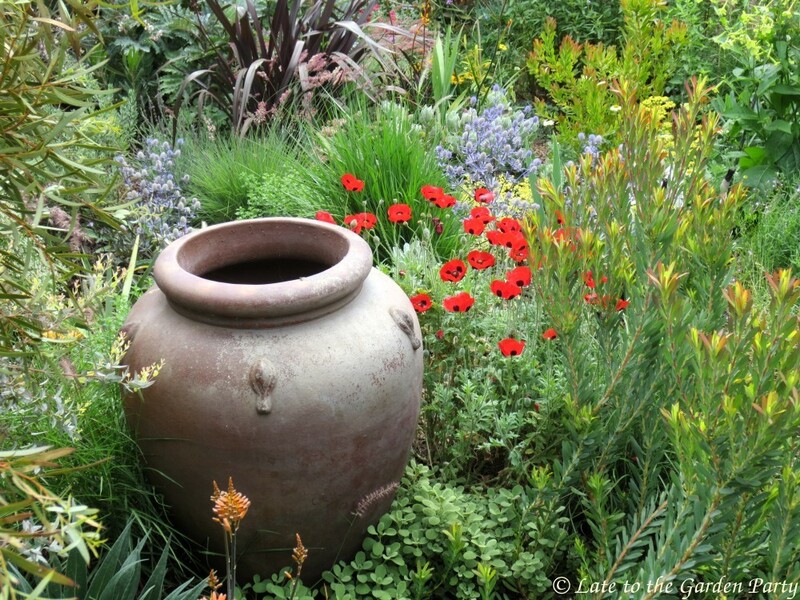 The gray foliage plant, shown here in the back view of the vase, is a bit of a mystery. Seedlings of what looked like lamb's ear appeared in various spots in my garden in late winter and, although the leaves are narrower than the Stachys byzantina I've grown elsewhere, I concluded that it must be that. I transferred the seedlings to the cutting garden. Now I'm not so sure. 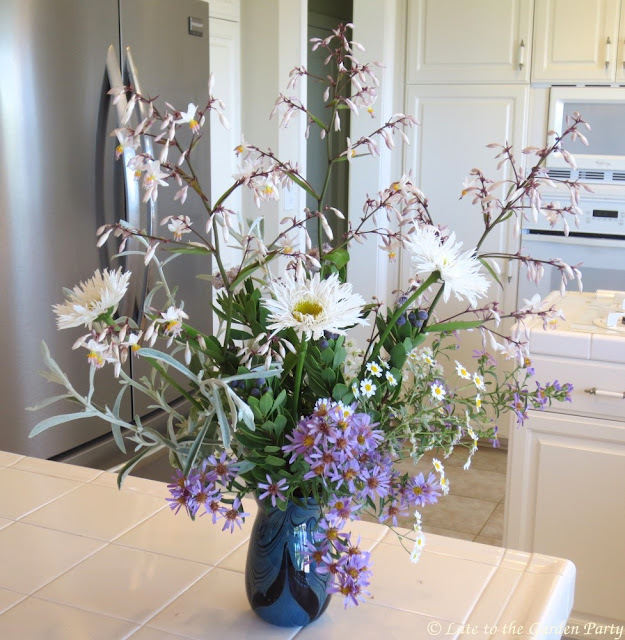 Getting a top view of this arrangement was tough. I had to stand on a chair to get this photo and still wasn't tall enough. 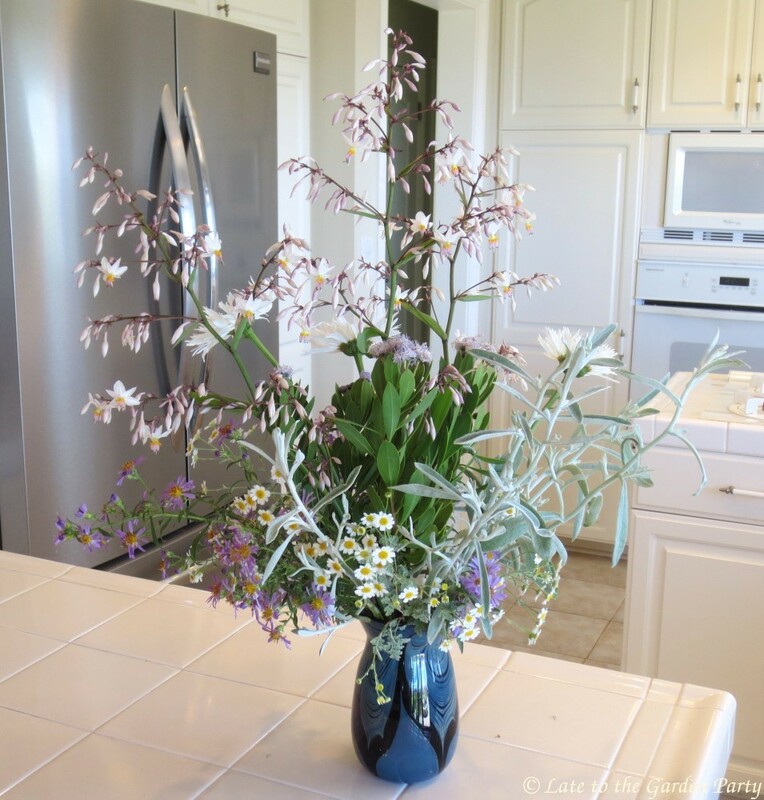 Here's a look at the purported lamb's ear in my cutting garden. If you have any other guesses as to what it might be, please pass them along. I don't think its a sage - it has no scent. It feels like lamb's ear but the leaves have remained narrow. It's also grown quite tall without developing any sign of flowers. Our heatwave is expected to last another couple of days but the marine layer is back full-force this morning, which should at least moderate our temperature along the coast. I can almost hear the garden sigh with relief - or maybe that was just me. 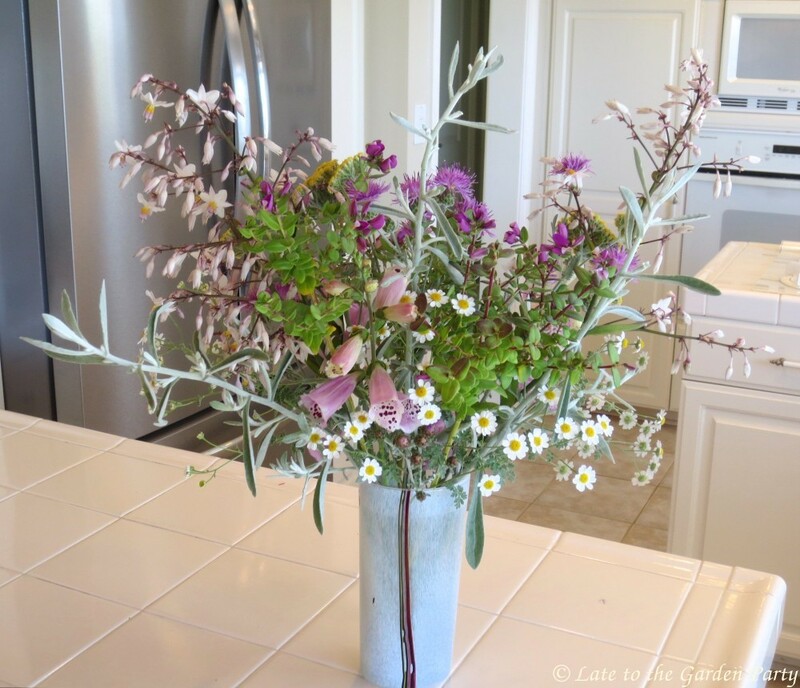 Visit Cathy at Rambling in the Garden, our "In a Vase on Monday" host, to see what other gardeners have used in their vases this week. As previously reported, I joined Denise of A Growing Obsession and Hoover Boo of Piece of Eden on the Long Beach leg of the Mary Lou Heard Garden Tour in early May. 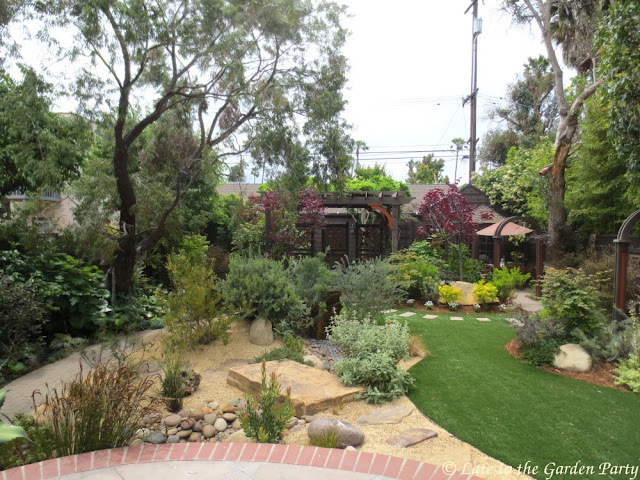 Our second stop after Dustin Gimbel's innovative space was a garden several miles away and close to the ocean. The extensive use of shredded bark mulch and decomposed granite in the front garden signaled that what had probably been lawn had been removed in response to California's extended drought and our water restrictions. The plants were understated but thoughtfully selected. 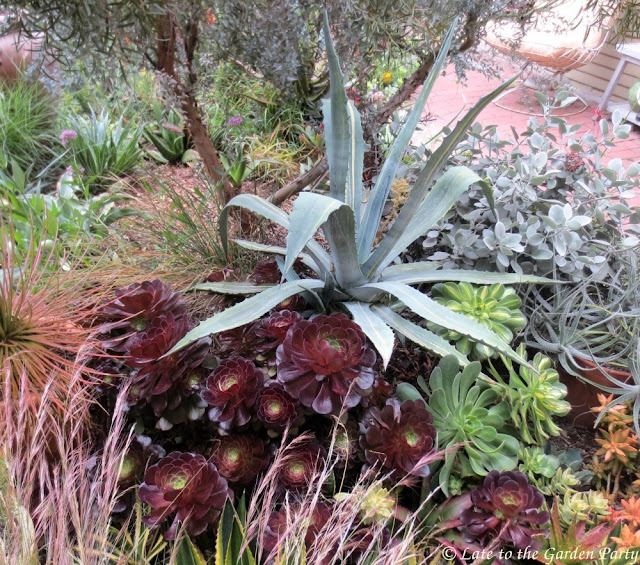 Coleus (Plectranthus scuttelarioides) and bromeliads were tucked in among the rock surrounding an established tree. Also spotted: Farfugium japonicum, Itoh peonies, a Leucospermum, and what I think is an Adenanthos. We moved down a narrow path at the side of the house to the back garden. I hadn't read the tour guide before we arrived and, as the home was located just off Ocean Boulevard, I expected a small space with more rock and decomposed granite than plants in the back so I was delightfully surprised by what we found. My goal was to transform a bland space of lawn into an inviting garden. 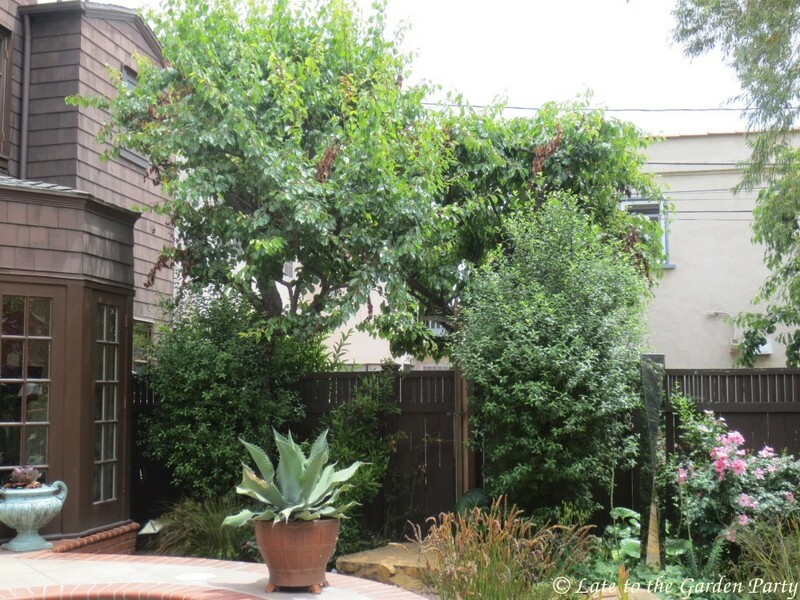 California design concepts encouraged me to reinterpret my desire for an English gentleman’s garden. 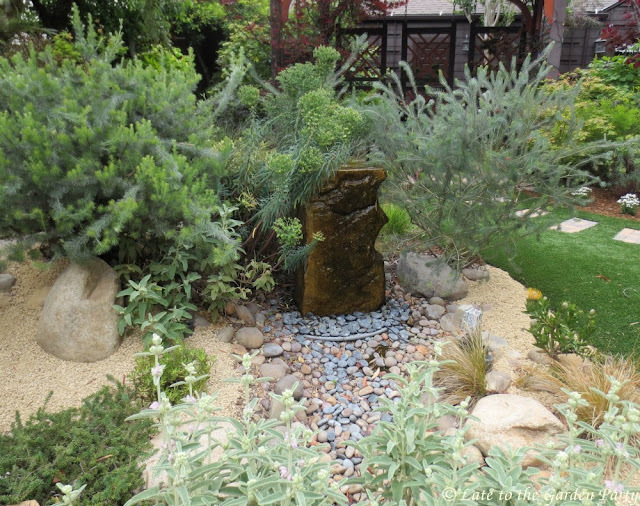 Existing trees would remain as the border for my new garden which I named “Bisbee”. Instead of fIowers, texture, form and leaf color dominate. Whimsy and playfulness are seen alongside classical elements like a pergola, arches, potted specimens, winding paths and water elements. Benches and seating areas invite you to linger; a subtle Zen is at play here. So please sit, feel the gentle breeze, breathe deeply, and relax. I hope you enjoy Bisbee and maybe, are taken back to a different time. The gazebo at the back of the property drew my attention first. 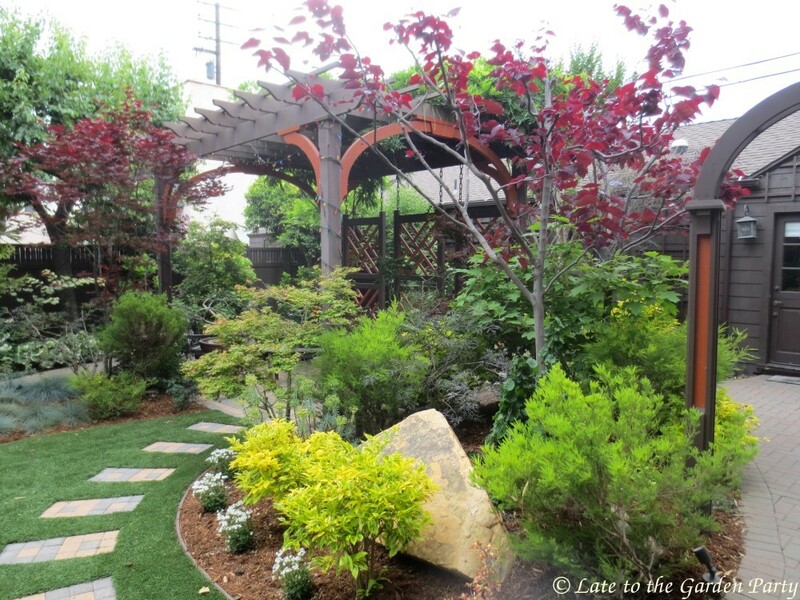 A closer look at the gazebo, which was surrounded by several Japanese maples (Acer palmatum). The gazebo's supports were wrapped in multi-colored lights. This collage gives you a look at some of the details within the gazebo. 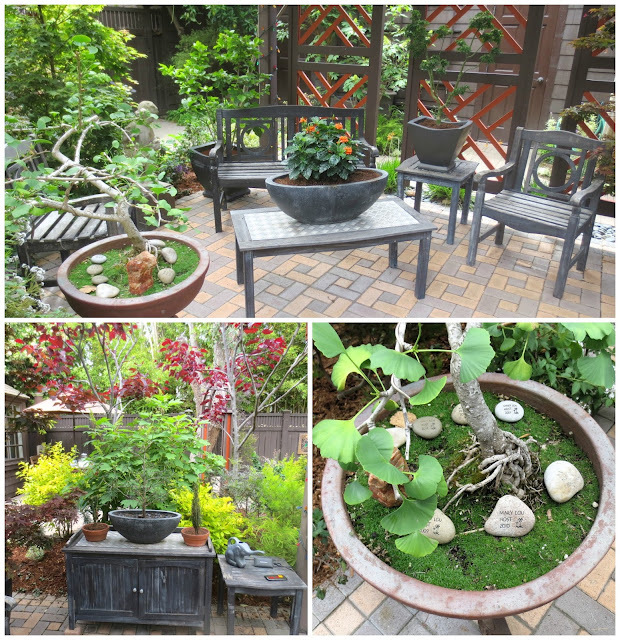 Based on the rocks sitting in the bonsai plant container on the lower right, the garden's owner has been a regular participant in the Mary Lou Heard Garden Tour. In addition to the gazebo, there was a table and chairs set into a back corner. Once I'd explored the gazebo, I took a more careful look at plant combinations and other details in the center of the garden. The area along this path was planted with more Farfugium japonicum, Acer palmatum, and what may have been an oakleaf hydrangea (Hydrangea quercifolia). The tree was draped with Spanish moss. This water feature occupied roughly the middle of the garden. 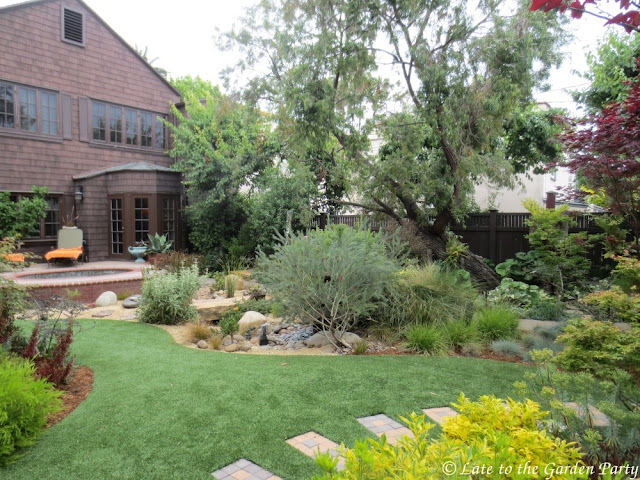 The perfect-looking lawn on the right was synthetic. There were some interesting details along the margins of the garden too. 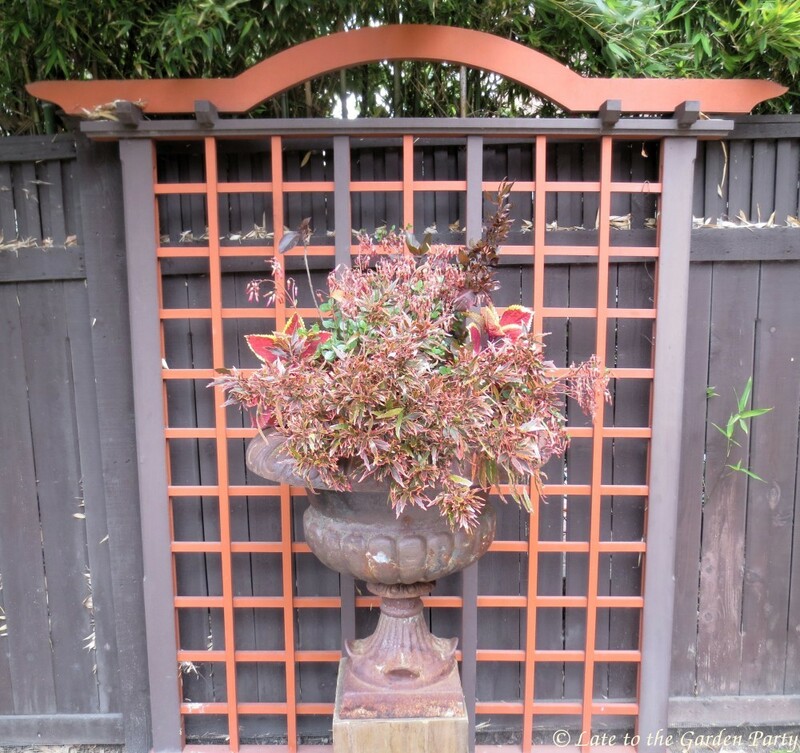 This urn sits along the fence on the opposite side of the garden. The neighbor's bamboo can be seen poking its way between slats in the fence. Then I took a closer look at the patio attached to the house, which I'd breezed by upon my initial entry into the garden. I neglected to take a photo facing straight on at the back patio. 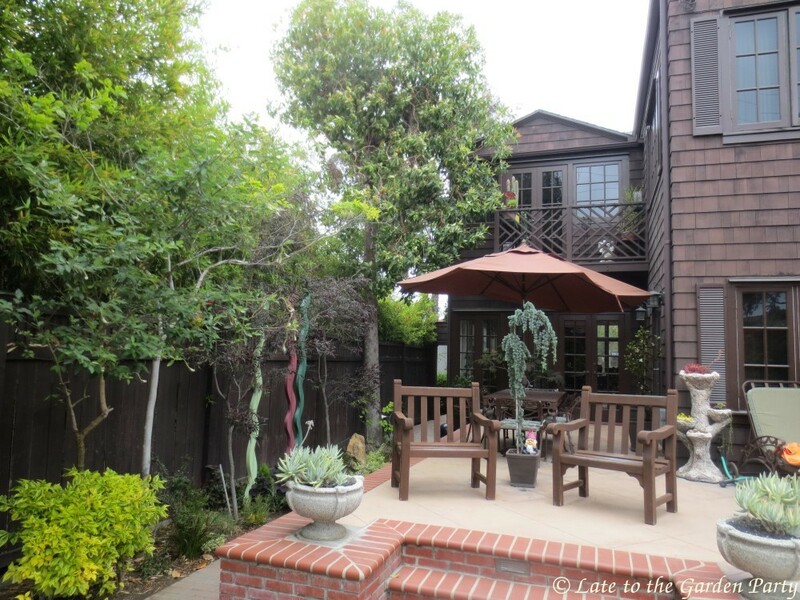 This photo picked up the half of the patio containing a spa and lounge chairs. True to the owner's statement, the garden did indeed have a zen-like feel. But while it had the restrained, spare aesthetic I associate with Asian gardens, it was still packed with interesting plants, many of which were drought tolerant. 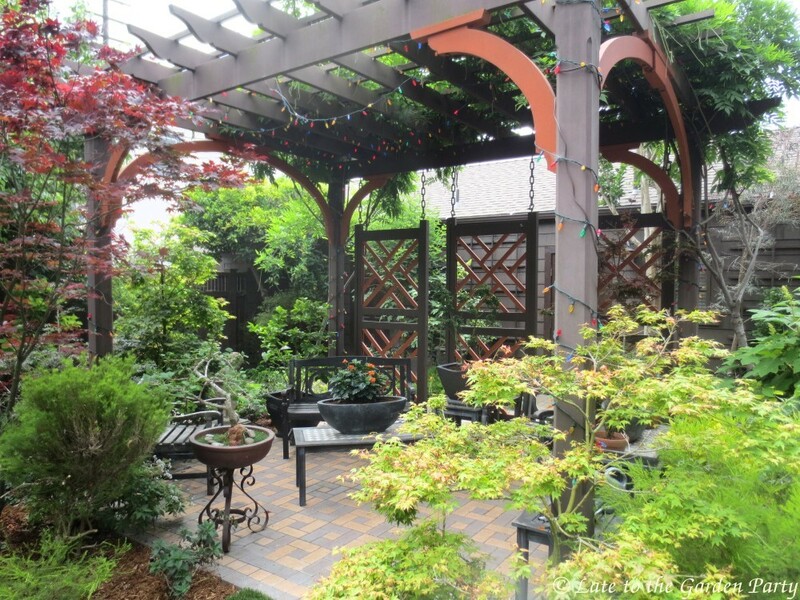 The garden also made effective use of repetition, both in the color of the plant foliage and the color and form of structural elements, like the gazebo and the arbors spaced along one path. I still have one more post to share from our May garden excursion but it seems that will spill into next week. Enjoy your weekend! 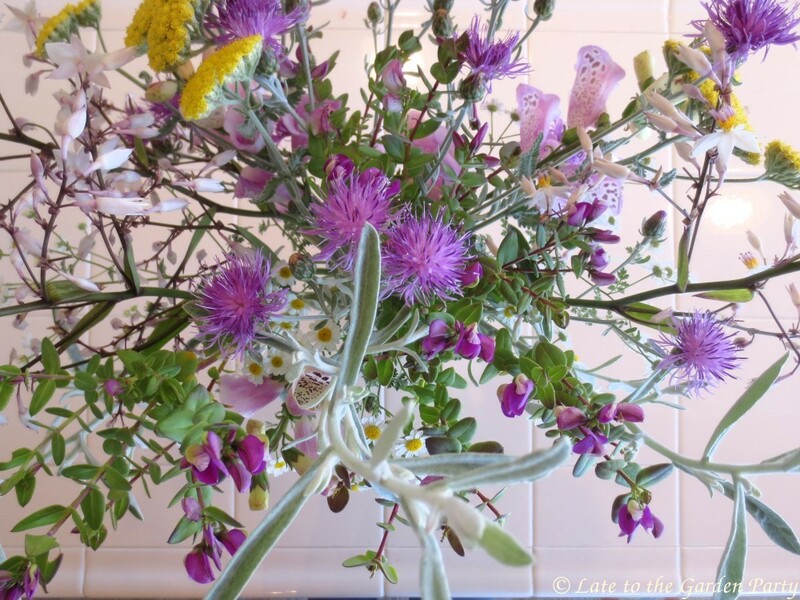 In a Vase on Monday: Wild or just weird?